Save Water. Save Money. Grow Stronger. What color tree T-PEE do I need?? 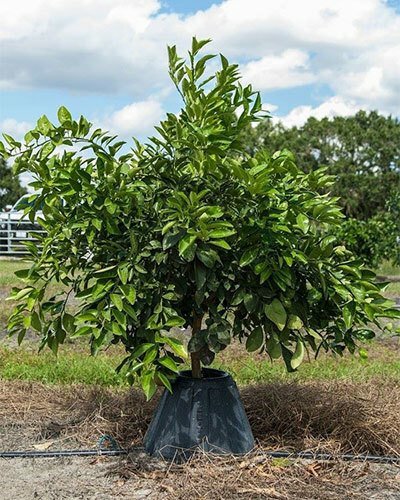 The black tree T-PEEs were designed for use with trees that flourish in heat and in tropical environments, such as citrus. The black tree T-PEE absorbs the heat, increasing the temperature by 12 degrees around the base of the tree. The white tree T-PEEs are good for trees that deteriorate in hot, tropical environments. How much frost protection does the tree T-PEE provide? Most well water is 72-degrees. When using the tree T-PEE with a micro-sprinkler, the well water increases the temperature at the base of the tree by 10+ degrees. The micro-sprinkler spraying the 72-degree water against the inside walls cause a mist that encompasses the tree keeping the tree warmer. How much water does the tree T-PEE conserve? Every five gallons of water sprayed within the tree T-PEE equals three inches of rain on the young trees. By containing the water within the 24-inch base, the water is directed to the roots and saves approximately 90% water compared to traditional practices. With the tree T-PEE you will use 75% less than your normal program requires. You’re not wasting it on weeds and grass, it’s all going to the tree. Is the tree T-PEE good for all citrus? YES! All citrus trees should have a tree T-PEE for a good head start. Does the tree T-PEE work on avocados? Yes. Your region and temperature would determine the color (White or Black) of tree T-PEE to use. What other types of tree application may the tree T-PEE be used for? Homeowners also use on tomato, and any other plantings in the yard! Yes, the tree T-PEE is a sprout inhibitor. Does grass grow in the tree T-PEE? No. Grass will not grow in a black tree T-PEE because of the increase in heat and lack of sun. How does the tree T-PEE help root growth? Because the water is contained around each tree, you get seven to nine inches of deeper root growth per year, and that makes for a stronger tree. How will the tree T-PEE affect the feeder root of my tree? Will the tree T-PEE withstand the wind? Yes, up to 60 mph. Can the tree T-PEE be used to keep animals from eating and killing young trees? Yes, one of the many added benefits of the tree T-PEE is critter control. How long should the tree T-PEE be left on for? From the very first day planted, and up to five years. This allows for good establishment of the root system. What do I do with the tree T-PEE after I remove it from the mature trees? You simply put them on your next reset or new setting. How long does a tree T-PEE last? Tree T-PEEs are made from 100% recycled plastic and have been known to last 20+ years. © 2016 tree T-PEE. Site Design by Zeekee.